Author: Clifford S. Deutschman, MS, MD, FCCM, et al. "It is appropriate for critical care nurses. The material is definitely not for novice critical care nurses. The appeal to this book is the amount of evidence-based information that it covers. Too much of what we do is based on how we have always practiced, which may not always be best practice. Although it may be geared toward physicians, it is also valuable to critical care nurses. There is some information that nurses won’t care about, for example the specific techniques of reading ultrasounds, but I did not ask questions on that type of information. Most of the information that nurses and physicians need to know to take care of patients overlap. This book definitely has a purpose, especially for nurses who want to know what the evidence is behind what they are doing. The more nurses understand, the better decisions they can make at the bedside." • The redefinition of sepsis • changing approaches to fluid administration • immune suppression in sepsis • monitoring the microcirculation • the long-term sequelae of critical illness • minimizing ventilator associated lung injury • benefits of evidence-based medicine management guidelines • rapid response teams • and more. 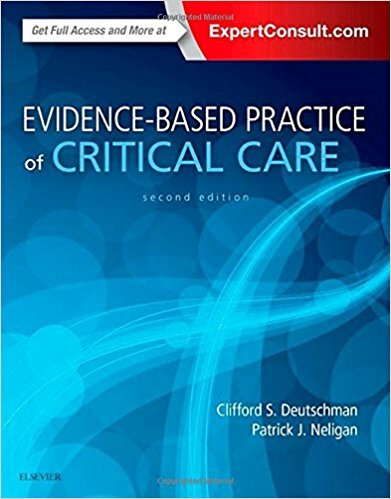 Evidence-Based Practice of Critical Care consists of three sections, each 22 contact hours, or a total of 66 hours when you’ve finished all three. What Lessons have Intensivists learned during the Evidence Based Medicine Era? Have Critical Care Outcomes Improved? What Problems are Prevalent Among Survivors of Critical Illness and Which of those are Consequences of Critical Illness? Do Early Warning Scores and Rapid Response Teams Improve Outcomes? What Are the Indications for Intubation the Critically Ill Patient? Is the Role of Noninvasive Ventilation in the Intensive Care Unit? How Does One Evaluate and Monitor Respiratory Function in the Intensive Care Unit? What Is the Optimal Approach to Weaning and Liberation from Mechanical Ventilation? How Does Mechanical Ventilation Damage Lungs? What can be Done to Prevent It? Is Extracorporeal Life Support an Evidence-Based Intervention for Critically Ill Adults with ARDS? What Factors Predispose Patients to Acute Respitory Distress Syndrome? What is the Role of Invasive Hemodynamic Monitoring in Critical Care? Does the Use of Echocardiography Aid in the Management of the Critically Ill? How do I Manage Hemodynamic Decompensation in a Critically Ill Patient? What are the Best Tools to Optimize Circulation? What Strategies Can Be Used to Optimize Antibiotic Use in the Critically Ill? Is Prophylaxis for Stress Ulceration Useful? What Fluids Should I Give to the Critically Ill Patient? What Fuids Should I Avoid? Should Blood Glucose Be Tightly Controlled in the Intensive Care Unit? Is Hypothermia Useful in Managing Critically Ill Patients? Which Ones? Under What Conditions? What Are the Special Considerations in the Management of Morbidly Obese Patients in the Intensive Care Unit? How Do I Transport the Critically Ill Patient? How Do I Diagnose and Treat Pulmonary Embolism? Should Exacerbations of COPD Be Managed in the Intensive Care Unit? What is the Clinical Definition of ARDS? What Are the Pathologic and Pathophysiologic Changes That Accompany Acute Lung Injury and ARDS? What Is the Best Mechanical Ventilation Strategy in ARDS? Is Permissive Hypercapnia Useful in ARDS? Do Patient Positioning in General and Prone Positioning in Particular Make a Difference in ARDS? Is Pulmonary Hypertension Important in ARDS ? Should We Treat It? Inhaled Vasodilators in ARDS: Do They Make a Difference? Do Nonventilatory Strategies for ARDS Work? Are Anti-Inflammatory Therapies in ARDS Effective? What is Sepsis? What is Septic Shock? What are MODS and Persistent Critical Illness? Is there Immune Suppression in the Critically Ill Patient? What Is the Role of Empirical Antibiotic Therapy in Sepsis? What MAP Objectives Should Be Targeted in Septic Shock? What Vasopressor Agent Should Be Used in the Septic Patient? How Can We Monitor the Microcirculation in Sepsis? Does it Improve Outcome? Do the Surviving Sepsis Campaign Guidelines Work? Has Outcome in Sepsis Improved? What has Worked? What has not Worked? How do I Diagnose and Manage Catheter-Related Bloodstream Infections? Is Selective Decontamination of the Digestive Tract Useful? Is Persistent Critical Illness an Iatrogenic Disorder? What is the Role of Autonomic Dysfunction in Critical Illness? Is Sersis-Induced Organ Dysfunction an Adaptive Response? How do I Manage Acute Heart Failure? How is Cardiogenic Shock Diagnosed and Managed in the Intensive Care Unit? When Is Hypertension a True Crisis and How Should It Be Managed in the Intensive Care Unit? How Does One Prevent or Treat Atrial Fibrillation in Postoperative Critically Ill Patients? Is Right Ventricular Failure Common in the Intensive Care Unit? How Should It Be Managed? How Does One Rapidly and Correctly Identify Acute Kidney Injury? How Does One Optimize Care in Patients at Risk for or Presenting with Acute Kidney Injury? What Is the Role of Renal Replacement Therapy in the Intensive Care Unit? How Should Acid-Base Disorders Be Diagnosed and Managed? What is the Meaning of a High Lactate? What are the Implications of Lactic Acidosis? How Does Critical Illness Alter Mtabolism? Is it Really Necessary to Measure Intracranial Pressure in Brain Injured Patients? How Should Traumatic Brain Injury Be Managed? How should Acute Ischemic Stroke be managed in the Intensive Care Unit? How Should Status Epilepticus be Managed? How should Guillain- Barre Syndrome be Managed in the ICU? Is It Appropriate to "Underfeed" the Critically Ill Patient? How does Critical Illness Alter the Liver? How Is Acute Liver Failure Managed? How does Critical Illness Alter the Gut? How Does One Manage These Alterations? Is there a Place for Anabolic Hormones in Critical Care? How do I Diagnose and Manage Acute Endocrine Emergencies in the ICU? How Does One Diagnose, Treat, and Reduce Delirium in the Intensive Care Unit? How Should Trauma Patients Be Managed in the Intensive Care Unit? What Is Abdominal Compartment Syndrome and How Should It Be Managed? How Should Patients with Burns Be Managed in the Intensive Care Unit? What Is the Best Approach to Fluid Management, Transfusion Therapy, and the End Points of Resuscitation in Trauma? How Should the Critically Ill Pregnant Patient Be Managed? How Do I Diagnose and Managed Patients Admitted to the Intensive Care Unit after Common Poisonings? How Should Acute Spinal Cord Injury be Managed in the ICU? When Is Transfusion Therapy Indicated in Critical Illness and When is it Not? What Anticoagulants Should be Used in the Critically Ill? How do I Choose? How Can Critical Care Resource Utilization in the United States Be Optimized? Does ICU Admission Improve Outcome? How Should Care within an ICU or an Institution Be Organized? What is the role of Advance Practice Nurses and Physicians Assistants in the ICU? What Factors Influence a Family to Support a Decision to Withdraw Life Support?